When it comes to matters of style, we live in carefree times, where CEOs sport hoodies and Casual Friday has taken over the whole dang work week. Still, every man should have a suit or two (or five) in his closet. For job interviews, weddings, meeting-the-parents, and other situations where a bit of formality is called for, there’s nothing better looking—and easier—to put on and look instantly pulled-together, than a classic suit. Now, that doesn’t mean shopping for a suit is something to be phoned in, so we’re here to help navigate the tricky waters of tailoring. Express designer for men’s tailoring, David Marmon — a man who knows how a suit should fit—talked to us through some of the most crucial things a guy should look for when searching for the perfect two-piecer. “Whenever I shop for myself or I help others shop, here are the things I look for,” Marmon reveals. 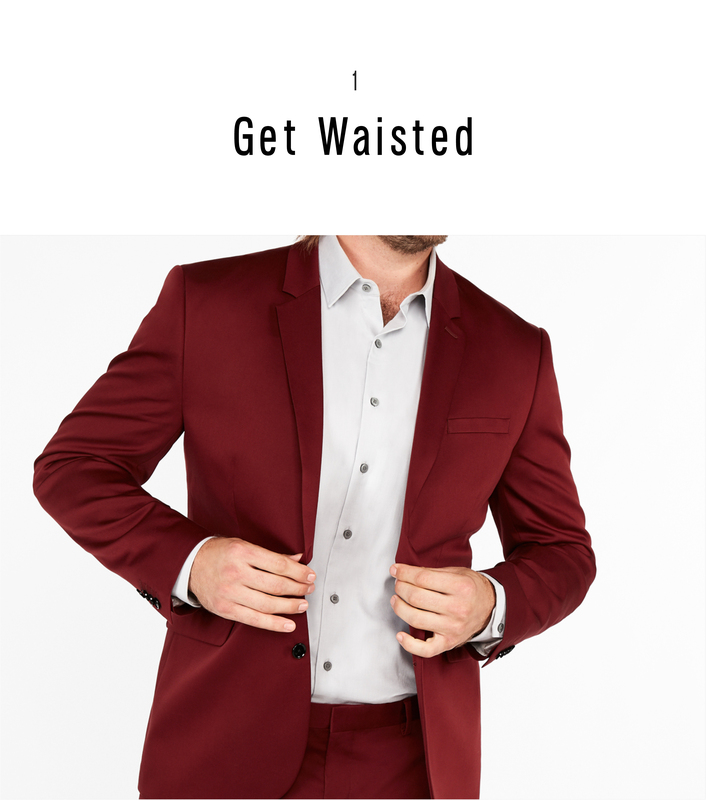 “You want to look at the waist—the natural waist, where the top jacket button hits.” So, no, when we say waist, we’re not talking about your hips. It’s closer to under your ribs, and there should be a gentle tapering in there. “You can only take it up so much, so it matters how tapered or slim it is. You don’t want it to pull too much or be too roomy either. I like it to be slightly pinched at the waist. I’m very much in the middle. I don’t want it to be roomy, but I don’t want it to flare out at the waist.” This gives you a bit of shape and structure, something like an hourglass figure, but, you know, manly. Otherwise, you just look like a big suited-up rectangle. Here’s a thought: bring your most fashionable guy friend of a lady friend who reads Vogue and loves shopping with you and have them give you their honest opinion. Shopping is intimidating but having a pal giving you advice makes it way, way easier. Oh, and treat them to lunch after, as a reward. While it may seem like the bigger the guy, the bigger the suit, that’s actually not quite right. 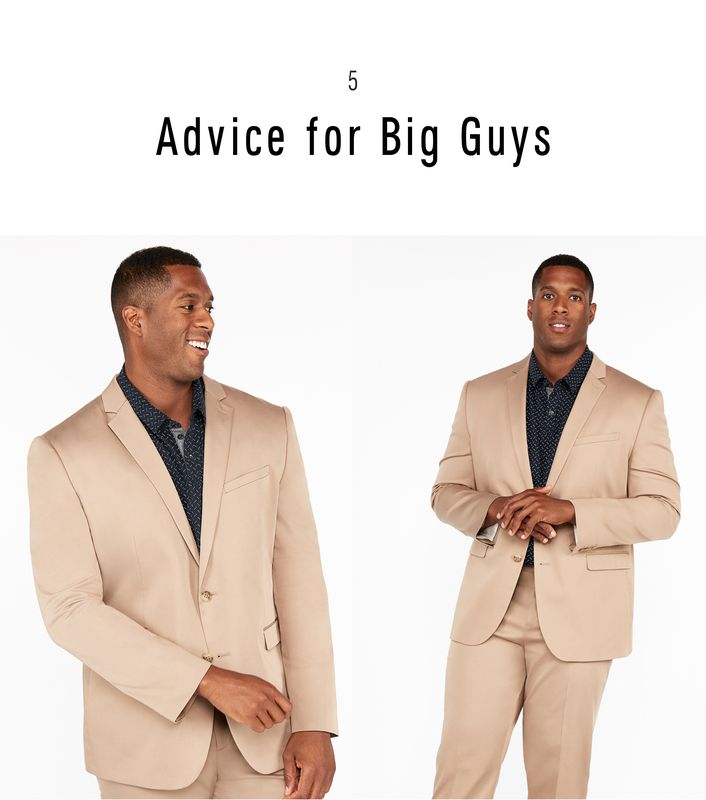 In fact, the opposite is true — a slimmer suit will give guys larger dudes more shape. “Get a suit that is actually cut a little bit slimmer, because it fits in the places where it’s important: the shoulders and the waist. It also gives you the illusion of the shape you’re going for.” While brands — us included — use terminology like “extra slim” or “slim” to denote the fit, that’s not meant as a directive of who should be wearing it. 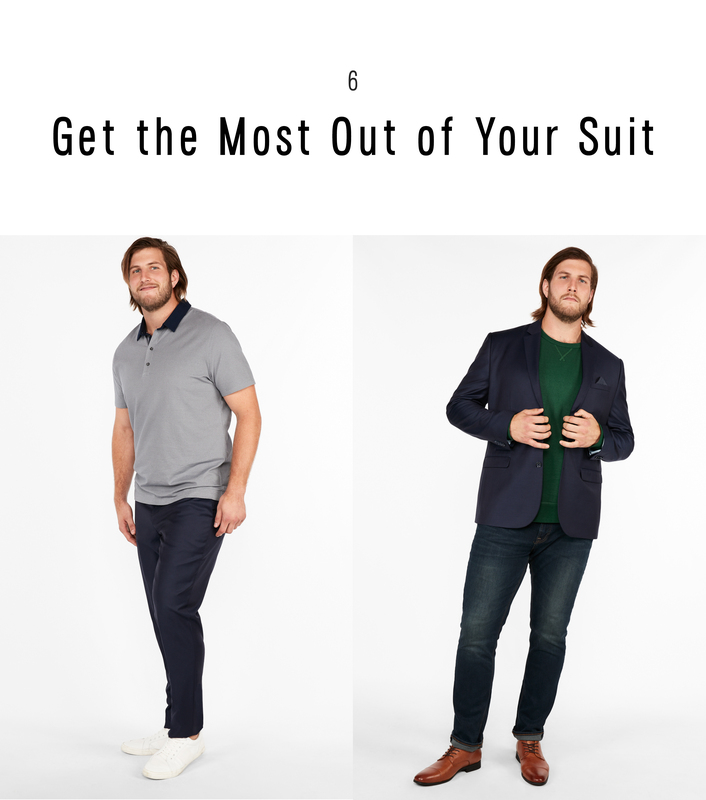 Slimmer fits actually can slim down guys whereas a “classic” fit is more a stylistic note, for guys looking for a more laid-back look. The more you know! Guys, exciting news! Suits don’t have to be worn as blazer-and-pants ad infinitum, forever and ever, until you die. You can mix it up (cue cheers). “In terms of styling, a suit jacket can be worn on its own as a blazer for going out,” Marmon says. 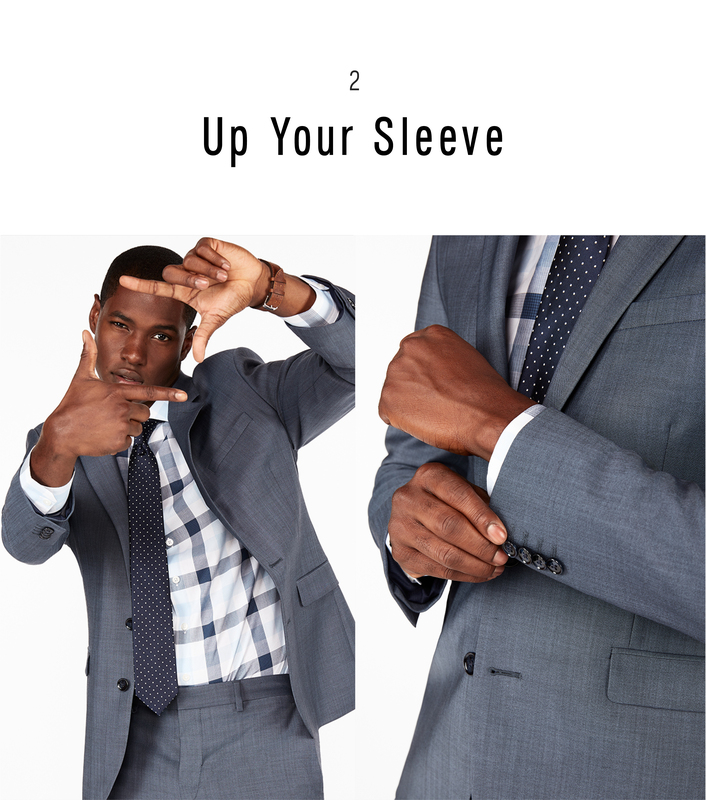 “You can mix it with other dress pants or even jeans. 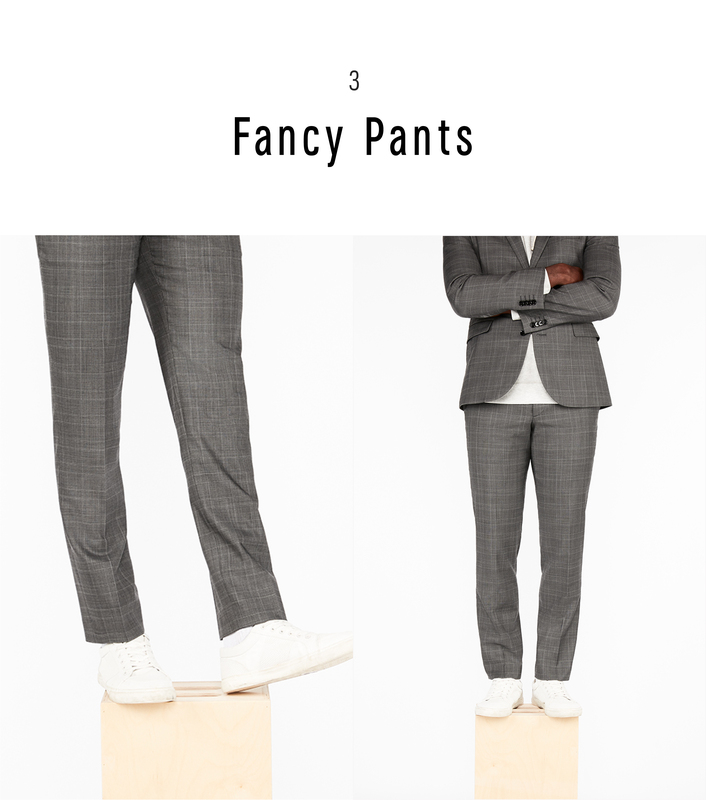 There’s an interesting emerging thing over the past year or two: guys dressing down dress pants, like putting on a smart pant with a sneaker and a dress polo. 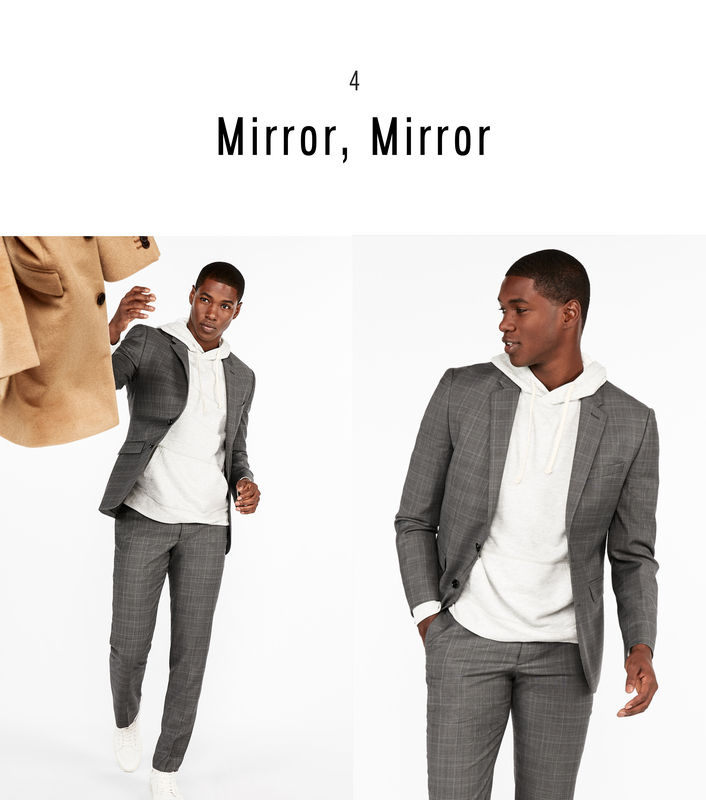 That very simple, basic contemporary silhouette, but with elevated items, whether it’s a dress pant instead of chino and a nice clean white leather sneaker as opposed to a running sneaker.” The options are endless. And in terms of underpinnings — that’s a fancy way to say what’s under your suit — it’s 2018 and the time has come to experiment. Try a nice T-shirt on warmer days or a turtleneck or crewneck sweater during chillier months. Swap out a classic Oxford for a denim shirt or a loud color or pattern, the fact that you’ll be wearing a jacket over it helps soften a crazy move to something a bit more palatable. The sky’s the limit, so go forth and have fun.